Google Webmaster Tools are a free, robust set of reports that allows bloggers and web-masters to view detailed statistics about their site rankings. In order to get the most out of Google Webmaster Tools, it is important that you not only add, but also verify your website or blog. 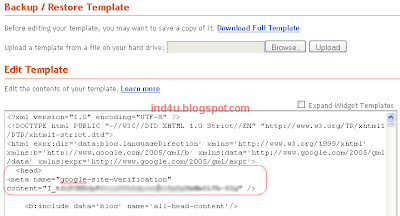 Here's how to submit and verify your Blogspot / Blogger blog for Google Webmaster Tools. Using the link in Resources below, visit the Google Webmaster Toolhome page. On the right-hand side, toward the bottom, click on"Create An Account Now". Follow the instructions on screen to create your account. 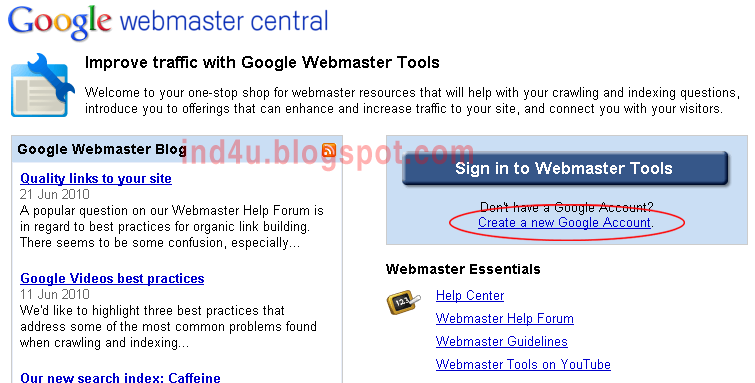 After you create account and logged in, return to the Google Webmaster Toolhome page to sign in. Note: If you already have a Gmail account then don't need to create a new account. 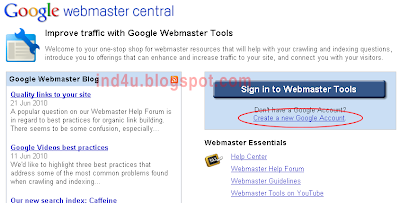 Just click on Sign in to Webmaster Tools type yourGmail id and password then click on logged in. then click on Continue. After you click "Coutinue" you will come to the Overview page. Google Webmaster Tools give a Meta Tag. Copy the complete meta tag code that Google generates. In a new browser window, go on Blogger Dashboard, and click on"Design" or "Layout"
Then click on "Edit HTML". In the Edit Template screen. 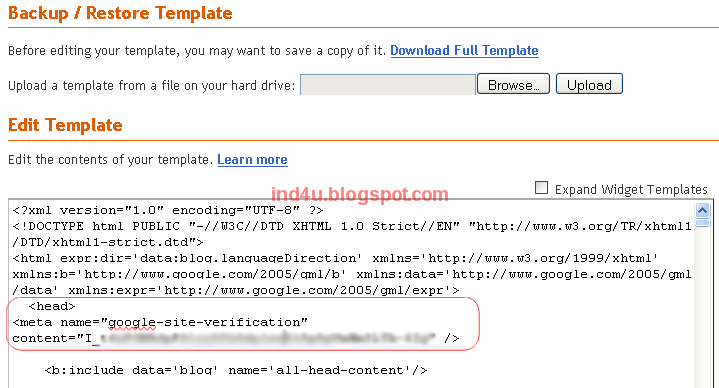 You will see the HTML script for your blog template. Toward the top, you will see the tag. Paste the Meta tag just below tag. If you need help, click on the image below to enlarge and view correct meta tag placement. Return to Google Webmaster Tools, and click on the "Verify" button. Google will confirm that it can view the meta tag that you've pasted into the Blogspot, and you will immediately be able to utilize the many tools and reports Google provided and your blog also add Google search engine.